Melvin Ang dropped out of polytechnic in his second year, and dived into a series of businesses to earn money. At 18, he sold refurbished guitars, which earned him $20,000 in a year. He later started a photography business with a friend. He co-founded Kanshoku Ramen in 2014 with zero F&B experience. 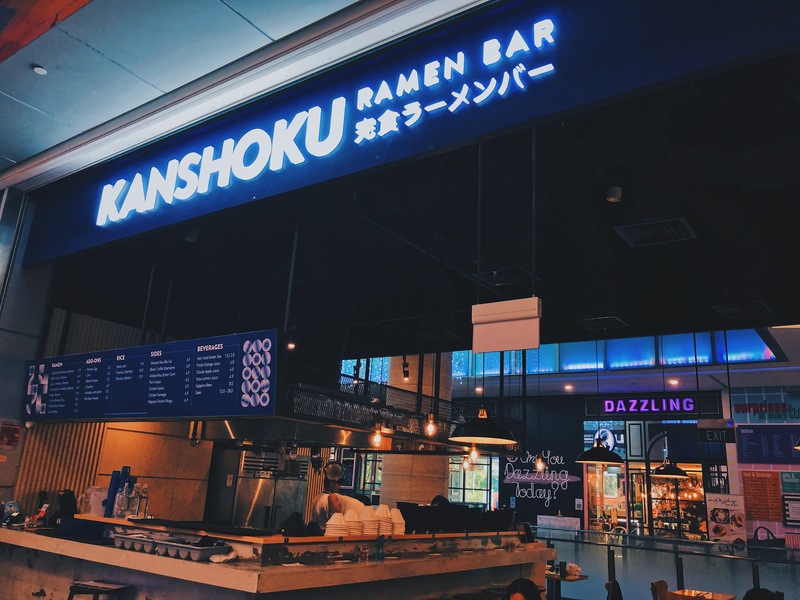 Fast forward to 2018, Kanshoku now has three outlets in Singapore. Its flagship outlet at Orchard Gateway crossed $70,000 revenue in just two weeks. 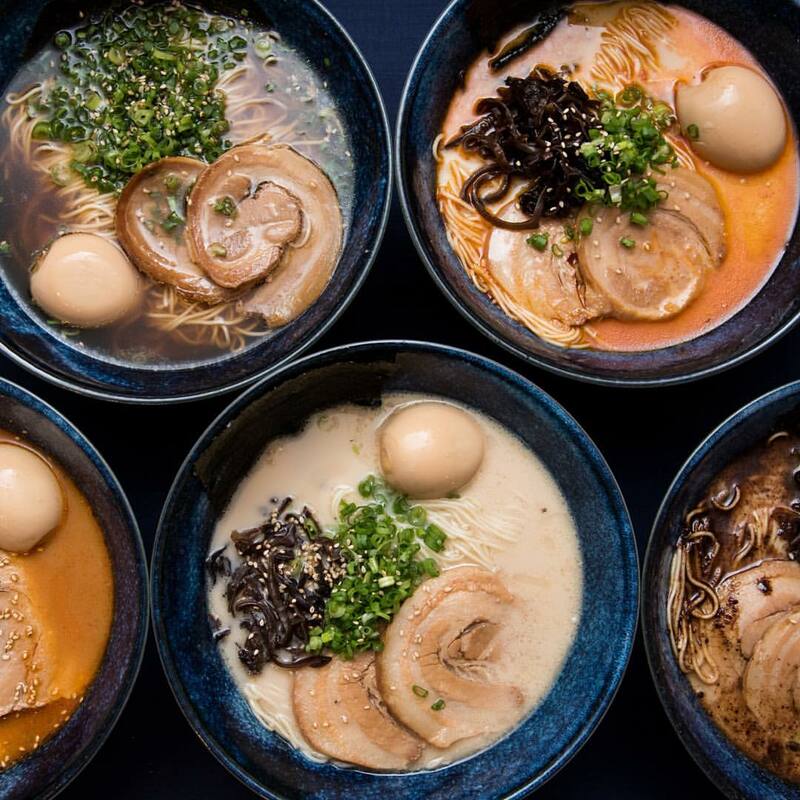 The ramen restaurant chain also raked in $6 million in 2018. Everyone has dealt with some form of family problems. For Melvin Ang, he came from a broken family. His father had been ridden with gambling debt since he was young, which inevitably drove a wedge between his parents. “My dad gambles and throws money unnecessarily, but he always provided [for the family] as much as he could. He wasn’t the best husband, but he was a decent dad,” said the 30-year-old, summing up his relationship with his father. His parents fought over money matters for years, but with the accumulation of other family issues, his mother became suicidal due to the emotional stress. He recounted a time when his brother and himself were woken up by the loud rattling noise of his kitchen window’s metal grille in the wee hours of the morning. When the brothers went to the kitchen, they were shocked to find their mother attempting to jump out of their 11-storey flat, with one leg already dangling out of the window. I [managed to] pull her down. My mother just sat on the kitchen floor [expressionless]. Then she looked up at us crying her eyes out, and the next minute, she started laughing hysterically before crying again. It was clear that his mother’s mental health had become unstable, and this greatly affected the young Melvin, who was only 18 then. “I didn’t really know what to do, but it was too much for me. I couldn’t sleep at night, I started missing lessons, and I started getting warning letters from the school,” said Melvin, who was a second-year engineering student at Ngee Ann Polytechnic at that time. He didn’t confide in any members of the school staff regarding his family problems, so the school naturally saw his frequent absence as a wilful act. Melvin consequently faced debarment, and was eventually kicked out of school. 12 years have since passed, and Melvin feels nothing but a pang of regret. On hindsight, he felt that he should have applied for a leave of absence instead of skipping on school altogether. Moreover, Melvin had excelled in school, scoring an average of 3.8 for his GPA. Despite his good grades, Melvin had become a poly dropout at age 18 — but he didn’t simply waste his life away. With his family struggling financially, Melvin sought ways to earn money and dived into a series of businesses. I started buying musical instruments to repair and sell. I refurbished guitars and sold them at a higher price. I remember my first sale: I bought a bass guitar at $150 and sold it for $330 within just three days! Wah, I was so happy! He even emailed Lakland Guitars, a Chicago-based electric bass guitar manufacturer that didn’t have a distributor in Singapore, to get a hold of their instruments. I wouldn’t even call this a skill. I just read up a lot [on guitars], so I knew how to clean it up and that just kickstarted things. I started buying, selling, buying and selling again. In a year, I made over $20,000. Even when he was a kid, he adopted the same business strategy. He would frequent ABC supermarket, which sells bargain goods, and buy canned drinks at 3 for $1. After chilling the cans at his house for a short while, he would tour the basketball courts in his Yishun neighbourhood and sell them to the exhausted players for $1 each. “Within 30 minutes, I get to cover 6 basketball courts and earn about $50 a day. It was damn good profit!” he exclaimed. “After the guitar stint, I paid off my school fees and had about $10,000 left. I then started a photography business together with a friend. I invested in the necessary equipments and sought clients, while he handled the photoshoots,” said Melvin. Called The Finishing Touch Studio, they specialised in car photoshoots, but the turning point for them was when they clinched a project with Epicentre. But three months later, the GM had an urgent project and ended up engaging them for a small-scale photoshoot. This particular project opened doors for them, and they slowly branched out into doing product shoots. The following month, they landed a major project at Epicentre worth $12,000. From them on, we had a lot more projects but it came to a point where I realised I couldn’t contribute anymore because I felt that my partner is capable of running it by himself. Business was so good that I didn’t need to actively source for clients. During the guitar stint, Melvin got to know Brendon Leung, a fellow seller on SOFT, who is now his business partner at Kanshoku Ramen. 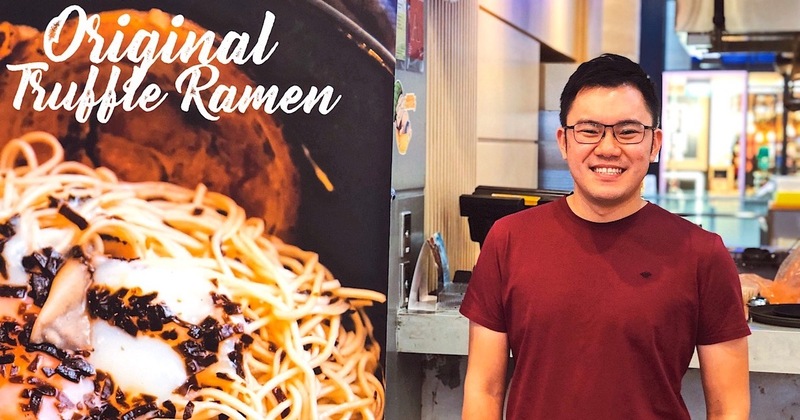 Melvin co-founded the ramen business in 2014, with zero experience in F&B. In fact, before he started up, he had never even cooked a bowl of rice in his life. His lack of culinary knowledge was what sparked the decision to delve into selling ramen. “I’m not a chef, so the food has to be simple and repeatable. Chinese ‘wok hei’ for example, has a smoky smell from the fire. But you cannot measure that fire — that is determined by the experience of the chef. But with ramen, all the ingredients and cooking processes are measurable,” explained Melvin. With the determination to pick up a new skill, he ended up learning recipes online with the help of his chef friends. He even experimented with his own dishes, such as truffle ramen, which is now a specialty of Kanshoku Ramen. Melvin confessed that he didn’t expect the dish to be such a hit, with sales dramatically increasing when they dropped the new menu. They did it right for me — they did all the marketing and advertising, and people got really interested in truffle-related food. There were so many truffle-related articles churned because of this, and Kanshoku Ramen always end up getting featured in those listicles, which we are very thankful for. 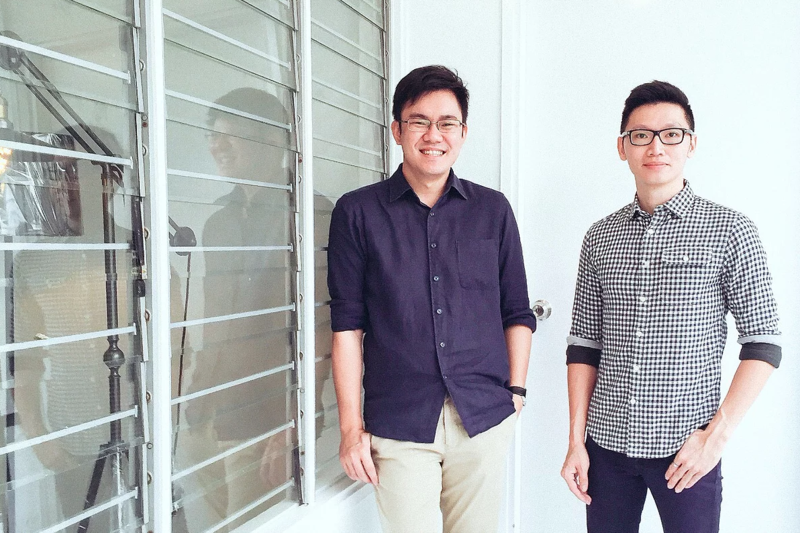 Young and inexperienced, the two bootstrapped their business and sought investors to back their venture. We found a company that wanted to invest in us. I actually asked for $2 million investment because I wanted to open 6 stores in a year — that was the plan. Our major partner were supposed to come in with $1.75 million, but they decided not to come through [in the end], for whatsoever reason. They bailed on us after we signed [the deal] and opened the store. Brendon had helped pump in close to $250,000 to open their first outlet at The Metropolis, and thankfully, the store was profitable since day one. “We took one year to break even. Every money we make, it goes to paying our workers and overheads first. We only took a small cut for our own salary. In fact, Brendon only started drawing salary up till 2 years ago. Before this, he didn’t want to take any money because he felt like he didn’t do anything [for the business],” said Melvin. He added that Brendon prefers to take a backseat, so Melvin is the one who oversees the business operation at Kanshoku Ramen. When the lease at The Metropolis was expiring, the duo opened a new outlet at Orchard Gateway, which now serves as their flagship store. The mall was very quiet at the start, so they weren’t sure if business would thrive at the new location. But all their concerns faded when they managed to break even in just two weeks, crossing $70,000 revenue in that short span. They hit $100,000 revenue in the second month, and the figure steadily grew for the consecutive months. As the town area proved to be lucrative, Melvin opened another outlet in the vicinity at ION Orchard the following year. Earlier this year, he opened Kanshoku’s third outlet at Northpoint City. “Every year, we opened one outlet. Our target is a total of 6 to 7 outlets. We are hoping to open another 2 more outlets, but that is still in talks,” said Melvin. Looking back on his entrepreneurial journey, Melvin said that he did not resent the investor who didn’t keep to his promise. He emphasised that it’s important to not give up once you’ve started on something. When you hone your craft a bit more, you might just get something out of it, he advised.